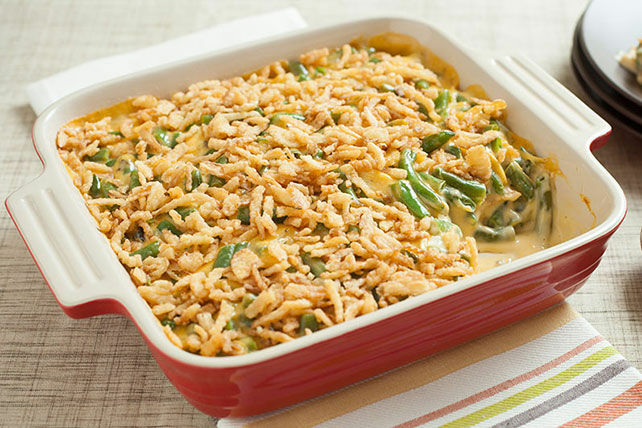 This green bean casserole is a favourite because it's delicious—but it doesn't hurt that it's also ridiculously easy to make! Mix Cheez Whiz and soup until blended. Combine beans and nuts in medium bowl. Add Cheez Whiz mixture; mix lightly. Spoon into 1.5-L casserole dish sprayed with cooking spray. Bake 35 min. or until heated through, topping with onions for the last 5 min. Wipe off any excess Cheez Whiz mixture from top inside rim of casserole dish before baking for easier cleanup.